With barrier reefs, jungles, mountains, rainforest, and the largest cave system in Central America, Belize has a vast concentration of natural wonders. Luckily, it's also invested in conservation, and the country has become one of the premier eco-tourism destinations in the world. With an economy that depends largely on tourism, Belize also has an invested interest in maintaining the natural health and beauty of the island environment. From the land, 36% of which is under protected status, to the surrounding waters, of which 13% are protected, the geography of Belize is critical to the success of its tourism industry. As such, Belize takes great pride in being a progressive eco-tourism and sustainable tourism country. Sitting on 300 acres of wooded coast, Kanantik Reef and Jungle Resort is one of the few eco-friendly all-inclusive resorts. Its 25 separate cabanas are made with primarily local materials and local labor, food is composted on-site, and a "wastewater garden" septic system helps prevent damage to Belize's delicate coral reefs. The Chan Chich Lodge's 12 thatched-roof cabanas (and one 2-bedroom villa) sit on 130,00 acres of private nature reserve in the plaza of a Mayan City. All the modern amenities are there—full-service bar, pool, and jacuzzi—but the lodge is heavily integrated into the natural habitat, and one of the best places to see the wildlife of Belize. The lodge even houses a pair of Wildlife Conservation Society biologists, who use the resort as a base of operations for their studies. Cayo, Western Belize is an ornithologist's delight, with over 500 species of native birds. And there are few better places to see them. Casa del Caballo Blanco is a six-cabana eco-lodge on the Mopan River that also plays home to the Casa Avian Support Alliance, a rehabilitation and release center. Consistently among the top-rated eco-resorts in the world, Chaa Creek is nestled at the foot of the Maya Mountains. The resort has 23 cottage-rooms surrounded by nature trails, Mayan temples, and rolling rivers. The conscientious eco-traveler could do no better than the affordable accommodations at the Macaw Bank Jungle Lodge, a small nature reserve and bird sanctuary in Cayo. The lodge integrates numerous green practices, including solar energy, organic gardens, recycling, widespread use of biodegradables, and careful construction of lodgings to have minimal impact on the environment. 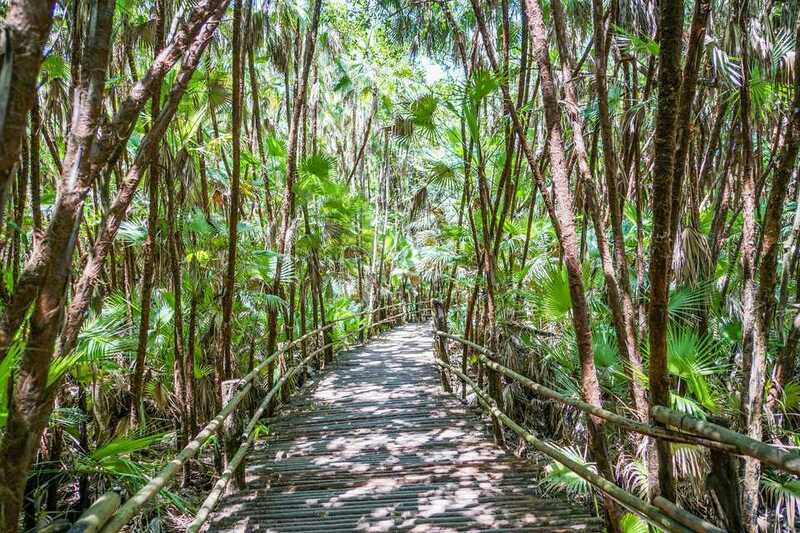 Step off the beaten path to a conscientious eco-resort in the Mayflower Bocawina National Park. Surrounded by waterfalls, the resort derives all of its energy from hydro, solar, and wind power, pulls drinking water from fresh springs, and offers a locally-sourced vegan, vegetarian, and fish-based restaurant menu. With Green Globe certification and ties to numerous conservation and sustainable tourism organizations, the Hamanasi Adventure and Dive Resort is one of the few beachfront getaways with a superior focus on the environment, from the careful cultivation of natural vegetation around the beach to the encouragement of environmentally-friendly practices among staff and guests. And with the reefs, waterfalls, abundant wildlife, and a protected nature reserve in the immediate surroundings, there's no shortage of adventure for the eager eco-traveler.